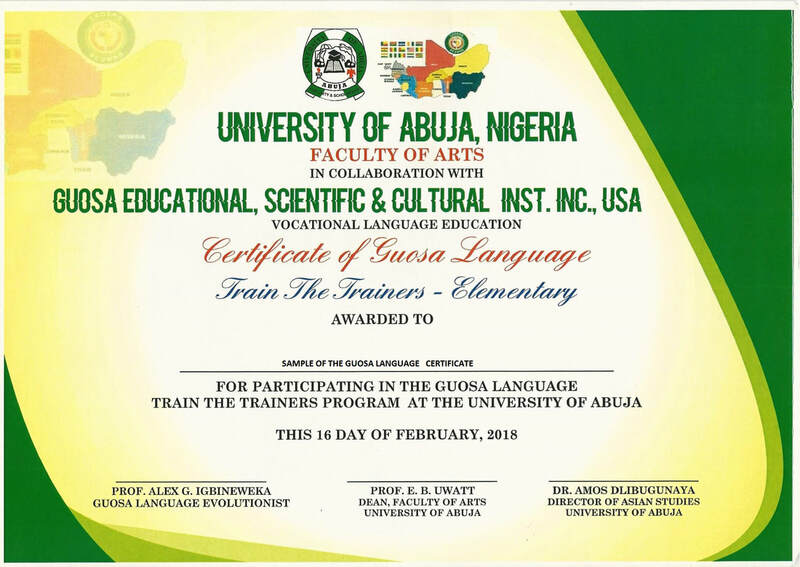 The maiden edition of the Guosa Language Train-The-Trainers was held successfully at the Faculty of Arts, University of Abuja, Nigeria on February 2 to 16, 2018. Thanks to the Vice Chancellor Prof. Michael Adikwu and all his dynamic academic and non academic staff and the students for making us proud in the linguistic and cultural unification of Nigeria and the Economic Community of West African States ECOWAS through the foundation laying of Guosa language. We also hereby wish to express our appreciations to the Nigerian Television Authority Abuja, under the leadership of Oganyan L. Simon, the General Manager NTA Abuja and other print medias for rallying round us to spread the good news.